I keep most of my writing fairly theoretical, and not too focussed on reacting to the latest events or controversies. However, it seems striking how the major questions at present are driven by factors that are not readily dealt with by economic theory. In particular, the situation in Greece is almost completely a question of political economy, Additionally, the amount of slack in the United States labour market is of critical importance from the standpoint of most theories, yet we have no good way of measuring it. UPDATE: With about one third of referendum votes counted, it looks like the "No" side has crushed "Yes" like bugs. Since the European authorities are quite happy to ignore voter's preferences, this may not affect the EU authorities' attitudes by much. But it definitely throws a spanner into their implicit plans for a regime change in Greece. My instinct is that the ECB will actually attempt to fulfil its mandate for financial system stability, and extend enough liquidity assistance in order to allow the can to be kicked down the road until September. (This is not because I assume that they care about Greek democracy; rather that their actions appear sketchy under European treaty law.) This way the eurocrats can enjoy their vacations in August, and go back to mismanaging the European economy when they return. Economic theory provides a framework to think about economic events, but I have limited hope that theoretical models can provide highly accurate forecasts for the near term. I believe that most academic economists would take such a view as being unremarkable, but this is not the case in market economic analysis. The financial media wants economists to have strongly held point forecasts about what will happen to the economy within the next few months, and once again, demand creates its own supply. Using a somewhat novel economic theory helps economists with their branding, which leads some to attempt to stretch the predictive power of their preferred theories to the limits. At the time of writing, the outcome of the referendum in Greece is unknown. My view is that the best outcome for Greece is for a "no" vote, and the rest of the Euro area cutting Greece out of euro are payment mechanisms. The Greek government will have no choice but to take control of the situation, and release a "parallel currency", although it may be billed as a temporary step. Some means of blocking the flight into euro currency notes to relieve the pressure on the banking system would be needed. Furthermore, some external intermediaries will need to step in, and be willing to trade foreign deposits for Greek deposits, in order to allow external commerce to once again function. Since Greece will need to default on its existing debt, the motivation of such intermediaries would probably have to be political (for example, a foreign central bank aiming to develop commercial relations with Greece). The alternative appears to be a collapse of the Greek government, with the situation reverting back to where it was in December, but with nobody offering a plan to deal with the situation (except perhaps the extremist parties). Even though the other European governments get rid of a leftist party that they obviously dislike, they have racked up even larger financial losses as a result of the Greek deposit flight. Destroying the Greek economy via inducing a bank run lowered the extremely slim chances that official creditors would ever be paid back. With respect to the euro area, the best theoretical approach may be to look at the history of economic thought, so that we can understand the rather deficient mental processes behind policy setting. This is the approach of Bill Mitchell, whose book Eurozone Dystopia: Groupthink and Denial on a Grand Scale I have just started reading. (The hardcover version is very expensive, but he has a rebate available on his website. The ebook version is somewhat more reasonably priced.) Economic theory can tell us how the euro zone could be fixed, but that is just wishful thinking given the nature of European groupthink. 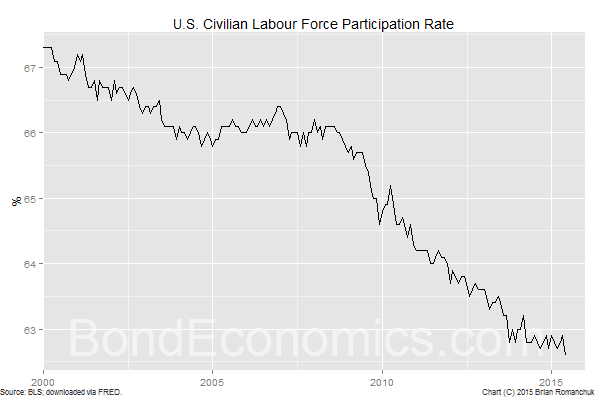 Whither The American Labour Market? Although I think the latter method is actually the most reasonable, it is obviously subjective, and does not meet the current fetish for quantitative models in economics. Therefore, there is no solid way of determining whether or not the current labour market is close to overheating, other than by waiting for another five years for data that we can analyse using non-causal methods. 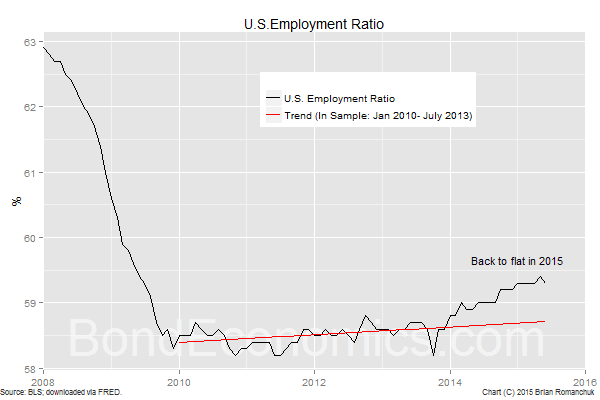 This means that even though there is a fairly broad theoretical consensus that labour market slack matters for the trend in inflation (and hence Fed policy over the medium term), we have no reliable method of calculating that slack. claims that a euro with Y (as the leading serial number letter on euro printed cash) can be considered the new drachma. "I know as I write this comment THAT the Greek polls will close in about 4 hours and that a lot of cash has left Greek banks. What I do not know is if the cash recently disbursed in Greece ALL has a Y as the leading letter in the serial number. If the cash has a high percentage of other leading letters, then the fact that Greece is a very small economy is a leading factor in deciding how euro cash is serialized. On the other hand, if a large percent (or all) of the recently disbursed cash has the leading Y, then Greece debt is being traded in the form of cash. What if most of all euro cash (including cash in not-Greek nations) had a Y leading the serial number? Then Greed debt is being traded as cash money throughout the euro zone. I have no idea about how widely spread the Y serial number issues are distributed. It would be an interesting and revealing statistic. " I think that the Greek situation will provide some new clues to better economic theory. The distribution of Y serial numbers may be one data based pathway. I do not see currency as being particularly important for most economic analysis. Most transactions are electronic, outside of small retail purchases and the underground economy. The situation in Greece now is fairly atypical, as people are effectively front running the potential for a new currency. This does not happen in sensibly managed economies. The "Y" marker exists, but it has no legal standing. Other than people who were paranoid in Northern Europe, nobody segregated bills. That has probably changed, but it is a little late. There's probably no data collected. Also, the minting operations were not run on a purely national basis (other than coins). Different countries would handle different note denominations, and so they had to be mixed. (I think Greece only was printing 10 or 20 euro notes.) Since the ECB wants to consider itself a transnational body, it did not care about the exact mix of minting. If Greece is cut off from the rest of the euro, the notes would have to be segregated. At that point, you might see data being collected. Yes, currency is a small part of the economic analysis. The much bigger part is deposits and the increase in debt. MMT would opine that stimulus comes from increased money supply. Increased money supply comes from an increase in both private and public debt. Put this perspective into the euro context. The euro zone would like for borrowing to increase but would also like to keep the money supply increasing at a modest rate. Because the euro zone is composed of several national central banks but a unified currency, a major question becomes "Who will increase the money supply?". Will it be the private sector or will it be a nation(s)? Greece seems to have acted as if it was going to be the vehicle that increased the euro money supply. In the eyes of the euro officials, the more money supply that Greece created, the less that could be created in other euro countries. Greece was monopolizing the ability of the euro zone to create money, taking a disproportionate share of the economic advantage resulting from the creation of money. Said another way, Greece was usurping the authority of the euro managers with a resulting disproportionate advantage to Greece. If we agree with this line of MMT logic, then we can conclude that the real problem with Greece is not the debt incurred; the real problem is with the unbalanced Greek government budget. The amount of Greek debt is peripheral to the need for a balanced Greek government budget. I think I agree with your logic here, but I,would not focus on debt levels in phrasing it. The way the euro zone is constructed, there is an issue with countries having loose fiscal policies, but benefiting from the price level stability in other regions. (This is a Chartalist argument, but now the taxes that maintain the value of the currency are being paid by foreigners.) Those in favour of punishing Greece would argue that is exactly what has been happening. Although there is probably some limited support for that argument, I would argue that the EU response has been far disproportionate relative to the magnitude of this effect.